Finally getting my bits back from the painter tomorrow so I've just dropped the front wheel out in preparation for fitting the mudguard etc. However, I also managed to lose the relationship of spacer / speedo drive. My forks have been reversed so the calipers are on the back but the speedo drive is still on the RHS. The parts book seems to show the spacer (8) on the inboard side of the speedo drive - can anyone confirm this (of course it all dropped on the deck when I took the spindle out)?. It looks as though the tang on the drive may not locate properly in the drive this way round. Obviously with my layout the spindle comes in from the left hand side. A little further investigation shows me that the distance between the fork sliders is 125mm. The spacer I have is 10mm long and the speedo drive 14mm. The width of the hub over the inner bearing races of the wheel is 75mm. 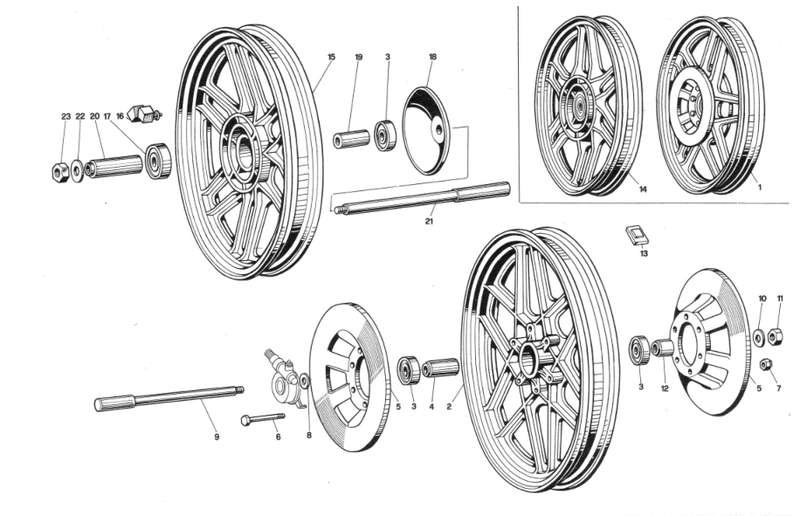 Assuming that the wheel hub is central in the rim then to centralise the rim would require a total spacer thickness of approx 25mm on the right hand (non-shouldered) end of the spindle. This can be achieved by fitting both the spacer and speedo drive to one side then pulling the shouldered end of the spindle up to the hub by means of the nut. If I put the 10mm spacer inside the speedo drive the tang does not contact the hub, whereas if I fit it on the outside the tang engages well. So the layout I'm looking at from the right hand side is 10mm spacer, speedo drive, hub. I'm thinking there should also possibly be a thin washer locating under the shoulder on the spindle against the bearing inner race on the left hand side but there was nothing present. Does this arrangement sound correct? My callipers are on the back of the fork legs which I thought was standard? Apologies I assumed with the date that it was a V50/3 but obviously not so ignore my ramblings I`m bound to wake up eventually!!!!! Yes, I've found a schematic on http://www.motointernational.com/parts-catalogs-moto-guzzi for the V50 III which looks like what I have - especially now I've found the shouldered spacer from the left hand side which had dropped out & rolled under the Ariel Arrow! From the diagram this fits with its reduced side towards the bearing, although the reduced section (3mm long) is the same diameter as the shoulder on the spindle so actually slides into the fork leg by that amount so that seems a little more feasible giving a bit more clearance for assembly. From the point of view of the bearing, I can't see it makes any difference which way round this spacer goes. The bearings, which seem in good order, are sealed ones which is nice. I'd refit with the calipers in front of the legs - I think it looks better (and dynamically makes little difference). Note - repack that drive unit with grease now. Repeat at least every year. They seem to be made from Edam and are prone to seizing - then the tang snaps off and you have to solder a bit of biscuit tin on there instead. My 50 had them at the front, and at low speed in the wet the "front" brake was absolutely useless, due to the water running down the mudguard bridge, dripping on the disc then going straight into the brake calliper. I think the theory is that having them behind reduces the polar inertia of the whole steering assembly although I suspect any difference that might make would be lost on me. Good tip on the gearbox and the grease tin is at the ready. The shouldered spacer on my bikes is fitted opposite way round to the V50/3 schematics thus agreeing with your assumption that it doesn`t matter which way round it is. Trouble is why make it shouldered in the first place, maybe it`s another case of parts bin components being used from other bikes, who knows!! Ah - that would have passed me by. The only time I use the front brake on mine is when I'm wheeling it around the front yard. I found out the time I had to put my right foot down while coming to a stop, and didn't.